This was a letter allegedly written by extradited middleman, James Christian Michel to Peter Hulet, then India region sales and liaison head of AgustaWestland. The entry of Sonia Gandhi into the election fray in Karnataka was a last minute decision by the Congress. Sonia addressed a rally at Vijaypura on Tuesday, her first in two years. The last minute decision was taken after it was found that Narendra Modi had seized the advantage from Siddaramaiah following his whirlwind tour of the state. The big-wigs from the Congress are set to storm Karnataka. Sonia Gandhi would address her first rally in two years while the former prime minister, Dr. Manmohan Singh will address the media at Bengaluru today. Congress president, Sonia Gandhi has been accused of having a hand in the Tehelka sting, “Operation West End.” This allegation was made by former Samata party president, Jaya Jaitly. The operation led to the resignation of George Fernandes as the defence minister. She also alleged that when the UPA was in power, Sonia Gandhi had asked then Finance Minister, P Chidambaram to ensure that Tehelka’s alleged financiers are not treated in an “unfair” or “unjust” manner. ‘An SPG Commando part of Congress president Sonia Gandhi’s security who had gone missing since September 3, was traced to a relative’s house near Tughlaq Road on Wednesday. The denial about meeting with the Chinese envoy and then accepting it has only made many wonder what was Rahul Gandhi being so secretive about. It was a major communication blunder about Rahul Gandhi’s meeting with the Chinese envoy. At first Rahul’s army declared the news as fake. The Chinese website went on to take out the link. After this the Congress came out and confirmed that Rahul had indeed met with the Chinese envoy. Rajnath SIngh and Venkaiah Naidu will meet with Sonia Gandhi to hold discussions on a candidate for the next President of India. The meeting is expected to held after the opposition meets later today. Congress president Sonia Gandhi has a better attendance percentage in Lok Sabha when compared to her son, Rahul Gandhi. Sonia clocked 59 per cent as opposed the 54 per cent that Rahul Gandhi had. With the burden on the on the security and exchequer getting heavier, the government is set to review the security cover to former prime ministers and their family members. The list of persons whose security covers would be reviewed are former Prime Minister, Dr Manmohan Singh, Congress president Sonia Gandhi among others. 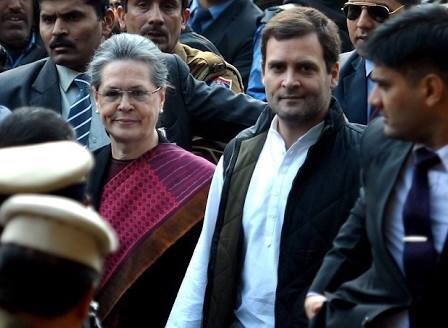 In a major setback for Sonia Gandhi and Rahul Gandhi the Delhi High Court has ordered a probe against the two in connection with the National Herald case. The court ordered an IT probe against the President and vice-President of the Congress party.